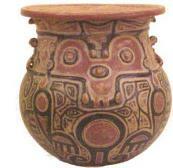 South America has an incredibly rich ceramic history. 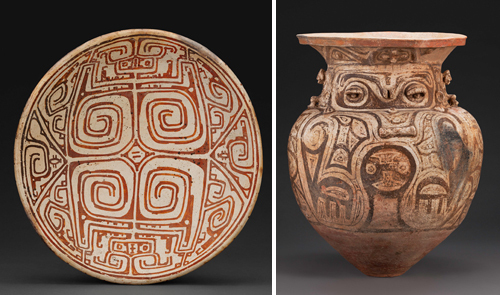 The number of cultures with distinct ceramic traditions over the last several millinia is truly staggering: Chavin, Moche, Tiwanaku, Huari, Inca, Teotihuacan, just to name a few. Since ceramics were an integral part of the lives of these peoples it is no surprise that there is a wealth of funerary works. 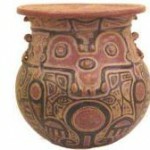 In this post Marajoara Ceramic Arts will be the topic. Plate and Funerary Urn, Marajó Culture, Marajó Island, Brazil; A.D. 400–1300. Earthenware with colored slips. Denver Art Museum; Collection of Frederick and Jan Mayer. The island of Marajo lies at the mouths of the Amazon and Tocantins Rivers in Brazil. It is the largest river island in the world, slightly larger than Switzerland. The inhabitants of this island developed what is considered to be the oldest ceramic art in Brazil and one of the oldest in the Americas. There are a number of distinct traditions over time based on the type of decoration used. 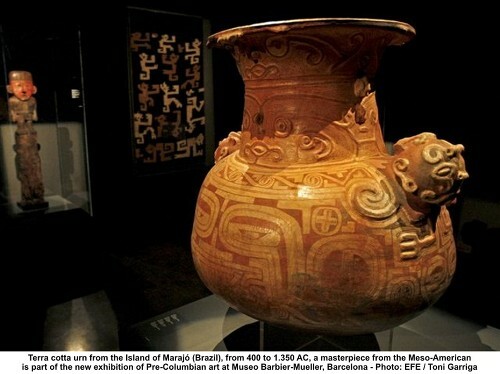 The original inhabitants of the island were the Ananatubas, the oldest potters, dating from the 1st millennium B.C.. Several distinct ceramic traditions followed but a great change happened in what is known as the Marajoara polychrome phase, existing from about 400 to 1350 A.D.. These ceramics have color and a richness and diversity in technique and decoration not previously seen. About 15 finishing techniques were used. These combined carving, sculptural detail, washes of red and white, excision, incision and polychrome painting using red, white, brown and black. The area of the island that was inhabited by this thriving culture is on a floodplain and underwater about half of the year.So the Marajo people constructed huge mounds to support their architecture and ceremonial spaces. In response to this periodic submersion a unique funerary tradition evolved. The dead were initially buried and then after a given period of time the bonedisinterred. Their cleaned bones were painted red and placed in a funerary urn. Marajoari urns are globular with wide mouths. The surfaces have intricate incised geometric decoration painted in white, red, and ochre. The size of the urn was related to the age, gender and social status of the person. The designs on the urns consist of decorative and symmetric patterns, labyrinthine designs and stylized images of humans and animals.